Boxcutters, Jigger, Shaker Classic/Boston, Citrus Juicer, Strainer, Large Martini Glass. 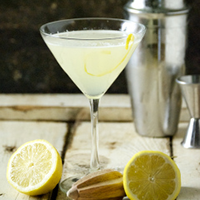 Combine and shake the gin, Cointreau, Lillet, and lemon juice over ice and let rest for a minute or so. While the ingredients are resting, pour about a half teaspoon of absinthe into a well-chilled Martini Glass and roll the glass allowing the absinthe to coat the sides. Discard the absinthe that remains in the glass. Give the ingredients another shake and strain it into your absinthe-rinsed glass. Serve with a lemon twist.